In the dim, cool, ground floor of the Dhakhwa House in Patan, I spot a photograph of an awkward teenager. She’s clad in a shin-length dress. Her hair is pasted to one side of her forehead with a pin. She stares at the photographer in part nervousness, part curiosity, as if trying to force a smile. I break into peals of laughter at the sight of the photo. It’s my mother’s youngest sister, the person I feared most growing up – she would twist my ears for even the slightest misbehavior. In the next photograph is another of my mother’s sisters, stuffing food into her mouth and laughing widely, sitting on a sukul at some whitewashed sattal in Gujeshwari. In the photo next to it, a group of men standd outside the Gujeshwari temple, a strip of the Bagmati river flowing in the background. One of the men in the photograph is my mother’s uncle. The next one is of my mother’s sister-in-law, turning her face away from the camera, staring at a branch she’s holding, as though looking for cover from an embarrassing moment. In her floral sari and her boy-short hair, my aunt looks like she could have been a character from the movies. It is when I see her that it finally strikes me how the photos came to be there. My aunt’s maiden name was Dhakhwa. The author of these pictures, Jujubhai Dhakhwa, was possibly a relative. In the courtyard of the Dhakhwa House, there are groups of youngsters looking at photos, giggling at men in Elvis Presley haircuts and bellbottom pants. I pass them as I approach an elderly woman. The way she is wearing her shawl, wrapped around her waist, its end thrown over her shoulder is typical of the Patan women I have seen on my mother’s side of the family. She pauses at every photo and spends some time craning her head studying them. I strike up a conversation and in her long drawn-out Newari, which is again typical to Patan residents, she tells me that she was on her way to the market when she happened across the photos and stopped. I ask her if she’s seen the other exhibits and she says it’s the first time she’s seen something like this. There’s something of a lost-yet-fascinated child in her expression as she goes from photo to photo. In my mind, I conjure a picture of an ageing housewife, with children, perhaps grandchildren, who is transported briefly to a different yet familiar world as she steps from one photo to another. One world into another; each picture being a world unto itself. That’s the kind of joy, release and relief the photos at the Photo Kathmandu festival seemed to bring to every individual who paused to breathe them in. I think of this woman as the perfect visitor. She was all by herself and had set her task aside for the time being, just so that she could live from photo to photo. The thought was a little overwhelming. And if you have ever experienced those brief getaways into little things that bring you respite, you know what I’m talking about. It could be a short walk into the night, a breeze, a drizzle, a few moments with a puppy, these brief, stolen moments add up to what life is a summation of. The 2015 Photo Kathmandu festival, the first of its kind hosted in Nepal, was successful, largely because of people like this lady I ran into. There were mothers bringing their toddlers home from school who stopped for a quarter of an hour; there were teenagers returning from school who meandered off; there were shopkeepers who took time off from waiting for customers. The festival transformed the city of Patan into an intriguing labyrinth. There were alleyways with worn-out walls that now demanded an audience because a set of press photos by Bikas Rauniar had gone up on them. 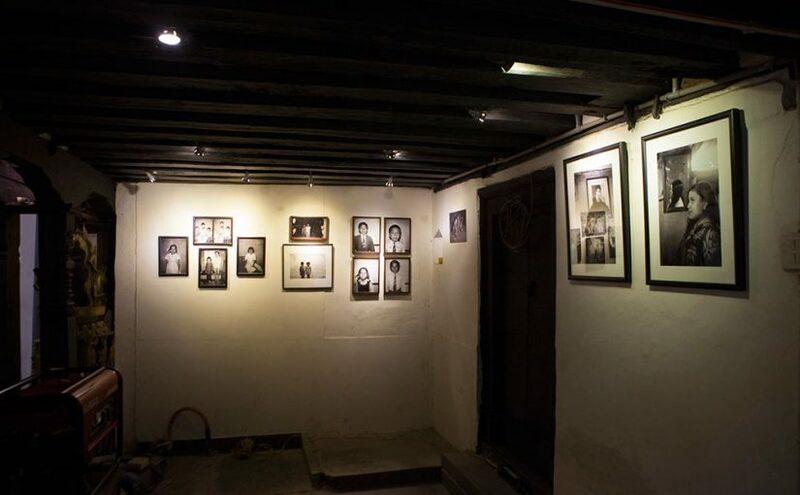 I spotted group photographs of women journalists I looked up to — Ramyata Limbu, Sangeeta Thapa, Hemlata Rai. The alleyways, after leading everywhere into one another, also led to the Yalamaya Kendra, where the photographers came together to discuss their work. While listening to colleagues Narendra Shrestha and Niranjan Shrestha talk about the tragedy of documenting a tragedy, for the first time since the April 25 earthquake, I felt like I was finally able to connect with the disaster more as an individual and not a journalist. I had tears in my eyes — as did many others who were there — as photographs that documented suffering flashed before us. Sessions like these were in sharp contrast to those of Kevin Bubriski, whose characters stare into your soul through the photos. They speak to you in a way that demands you throw more than a cursory look at an individual, regardless of where they come from. They demand a conversation. Then, there was the work of Sohrab Hura, who did not have an exhibition up but presented his work in artist talks. It is a stark reality he records in his photos and the darkness is beautiful because it is real and because it speaks to the scared child inside you. Photos of the mess that homes tend to be — they are photos of the soul because the soul is torn with a love of longing and tangled in what the heart wants to untangle. That was Photo Kathmandu 2015 — the coming together of memories, the collision of yesterdays that created a mosaic for what tomorrow holds.